In my last post, I talked about creating random values for all kinds of interesting types. One of the biggest complaints I get when encouraging developers to implement unit tests (or dare I say even start thinking about TDD as a development methodology) is that testing code that accesses databases is a huge pain. For this reason, most code is written to use a data layer which is accessed by easily mockable interfaces. But what of the data layer itself? Well too often it goes untested, occasionally some brave developer might introduce a ‘test database’ into the solution, or even a ‘test script’ for building a test database. But that takes time, it’s a pain and nine times out of ten it’s overkill. As an alternative, I decided to create a really simple set of classes that implement IDataReader and IDataRecord, and (as much as possible) allow simulation of a SQL Server connection. The goal was to allow unit tests to be created quickly and (most importantly) consistently without requiring a separate database. The first step to achieving this aim was to be able to define what a recordset looks like. All this information is required by the above interfaces, so it was a good starting place. To do this I started by looking in the System.Data.SqlClient namespace which is defined in the System.Data assembly. Using reflection I quickly found the internal MetaType class, which handily defines all the known types supported by SQL Server. From the information gleaned from reflection, I could create my own class that given a SqlDbType (or even a DbType) could fill in all the other useful information for you automatically, using an ugly (but highly effective) large switch statement. /// Initializes a new instance of the <see cref="ColumnDefinition" /> class. 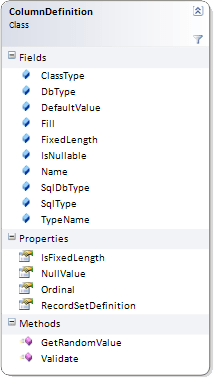 The fill parameter helps indicate whether any values used fill the length (e.g. for fixed length types like char) or whether the length indicates a maximum (e.g. for varchar). The isNullable parameter is self-explanatory, but it is notable that the defaultValue must always be supplied if isNullable is false. // To create a record that implement IDataRecord we start with a record set definition. This immediately meets our goal of providing a clean intuitive syntax for quickly defining a table (or recordset) to be used by our reader. Once we have a definition for a recordset we can create records. The easiest way is with the ObjectRecord class. The constructor used accepts a RecordSetDefinition and a set of values (of type object ) which are validated against the definition. Any missing values (in the above example the ‘Active’ column is not supplied) are set to their defaults as defined by the RecordSetDefinition . /// Initializes a new instance of the <see cref="ObjectRecord" /> class. With these two classes, we can create an object that faithfully implements IDataRecord, without installing a database into our test project. Next time we will look at creating a record set and a data reader, but in the meantime, you can view the code on GitHub or use the download link below to see the complete project.